Far Cry 5 was a great game — and that’s what frustrated me about it. Ubisoft’s Montana-based action game made some fundamental changes to the long-running series, with a clever structure that made the experience feel truly open. No matter what you did, whether killing some drugged-out cult members or hunting wild turkeys, it contributed to your progress in a way that felt meaningful. Unfortunately, all of that was tainted by the story, which used the imagery of modern American turmoil to create an artificial sheen of depth. Far Cry 5 wanted you to think it had things to say about cults, white supremacy, and religious extremism, but it never actually said anything. It was all just wallpaper. That’s why I was particularly excited about Far Cry: New Dawn. The post-apocalyptic game takes place after the events of Far Cry 5 when — spoiler — the fictional town of Hope County is devastated by a nuclear blast. The result is a Mad Max-style wasteland, dotted by pink flowers and filled with destructive vehicles and cobbled together weapons. It felt like the perfect fit for Far Cry’s particular blend of mayhem; more importantly, it looked to get away from the empty political imagery of its predecessor in favor of something more befitting a ridiculous action game. Unfortunately, New Dawn doesn’t go far enough. 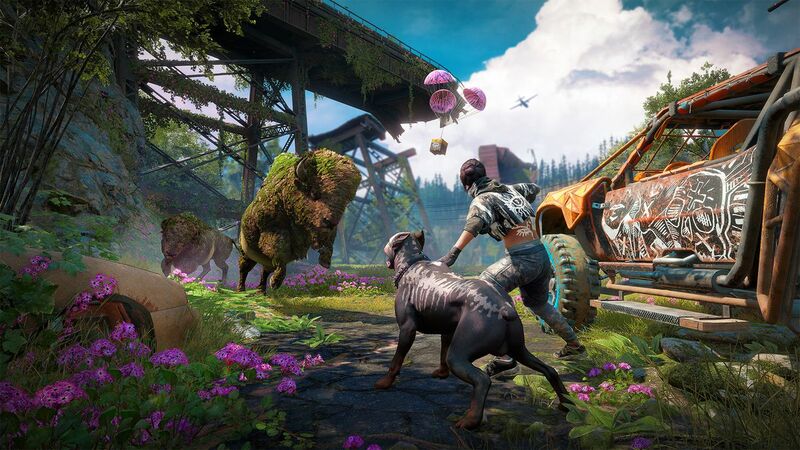 Its vibrant apocalyptic world is an entertaining playground, but also doesn’t feel all that different from past Far Cry games. Worse, it gets away from Far Cry 5’s freeform structure with tedious but necessary grinding, particularly towards the end. It’s still fun in that “anything goes” way Far Cry always is. But New Dawn mostly feels like a missed opportunity. The opening is very similar to Far Cry 5. You play the nameless security chief in a group that rides around the country, helping to build settlements in dangerous places. Hope County is particularly hazardous. New Dawn takes place in the kind of post-apocalyptic future where nature has returned, so life isn’t as dire as in, say, Fallout. With this backdrop, a small settlement called Prosperity pops up, a refuge for those returning to the surface after years waiting out the devastation in underground bunkers. It’s peaceful and friendly. But of course that doesn’t last for long. The scourge of Hope Valley is a pair of sisters known primarily as The Twins, who lead a violent gang that seems intent on terrorizing everyone and gobbling up what little resources remain. There’s not much more to them than that. But that lack of depth actually makes them an ideal Far Cry villain: the twins and their crew are irredeemably bad, so you don’t feel bad killing hundreds of them. The goal, as in virtually every game in the series, is not just to take out the bad guys, but to expand your domain across Hope Valley. Prosperity is a relatively small commune, and much of the game is spent liberating outposts, further spreading your influence. As always, it’s very satisfying watching the map — which starts out dark and dangerous — slowly turn in your favor. If you played Far Cry 5, exploring the post-apocalyptic rendition of Hope Valley is eerily familiar. Farms and homes that you visited in the previous game are now in ruins, sometimes hiding dark secrets or useful supplies. With its cult theme, Far Cry 5 was filled with doomsday preppers, regular folks who built bunkers anticipating the end of the world. They were a fun diversion in the previous game, but in New Dawn they’re some of the most bountiful places to uncover. One thing that remains the same is that New Dawn is still teeming with wildlife: a trip up a mountain could mean a skirmish with a cougar or bear, and there are plenty of deer to hunt and fish to catch. There are new, irradiated versions of normal animals; going up against a glowing buffalo is not something I would recommend. The game also brings back one of the best features of Far Cry 5, “hired guns,” where various AI characters serve as a co-op partner. There’s a violent preacher, a sniper grandma, and, naturally, a very good dog. I wish Ubisoft had gone farther with the post-apocalyptic theme. Far Cry 5 already took place in a typical small town turned into a warzone, and a few years after a nuclear bomb laid waste to it all, the place feels remarkably similar. The same goes for the story. New Dawn is a standalone game, but it’s not a one-off experiment in the mold of the cyberpunk-tinged Blood Dragon or the Stone Age-themed Far Cry Primal. It’s more of a small, direct sequel to Far Cry 5. The good thing is that, while New Dawn looks and feels incredibly familiar, it manages to mostly get away from the narrative and thematic issues that plagued Far Cry 5. It doesn’t pretend to have anything to say. But it also introduces some of its own problems. New Eden, the violent religious cult that was your main enemy in the previous game, returns in New Dawn, but this time as a kindler, gentler kind of cult. At one point you even work together. Given the events of Far Cry 5, it’s unnerving to see the group mostly redeemed in the sequel. That said, the post-apocalyptic theme does lead to some very cool events. There’s a Twisted Metal-style vehicle combat arena, and a tense assassination inside of a bullet farm prison. I also really loved the strange and wonderful weapons you can craft; there’s a sort of crossbow that fires saw blades, and a shotgun with a strange, yellow glow. Aside from some uncomfortable revisionist history regarding Far Cry 5’s main villains, New Dawn has all of the elements for a great Far Cry experience. The main issue, though, is that New Dawn gets away from the structure that made Far Cry 5 so memorable. In the previous game, your main goal was simply to create as much mayhem as possible, forcing the cult leaders to confront you. This meant that nearly everything you did felt like it was tied to the narrative, whether that was explicit story missions or side activities like blowing up oil tankers or razing farms. Diversions had a purpose. New Dawn isn’t quite so free. Instead, the way you upgrade Prosperity is by collecting ethanol which, conveniently, can only be found at enemy outposts. But you need a lot of it, and there are only a handful of outposts to conquer. The solution Ubisoft came up with is that you can unliberate outposts, and then take them over again fighting even tougher enemies, acquiring more ethanol in the process. Not only does this make zero sense, but it proves to be incredibly tedious. Worse still, it’s not optional; in order to do things like craft high-level weapons, which you need for late-game battles, you’ll have to go through this process a few times. Maybe I expected too much from what is ostensibly a small spinoff. 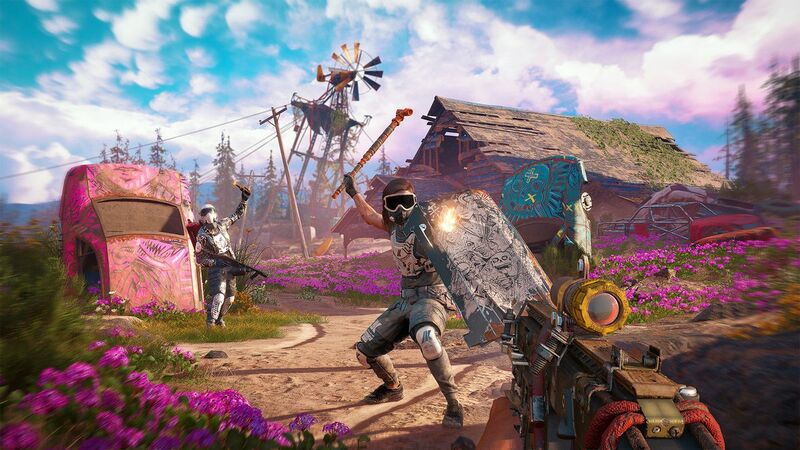 But the idea of combining Far Cry 5’s base game with a silly, violent, colorful post-apocalyptic setting seemed like the perfect recipe, one that would showcase the series for what it truly is: a big, dumb action game where you can do virtually anything you want. Instead, New Dawn is an overly familiar experience that, while a lot of fun, gets away from the best part of its predecessor without adding enough that really feels new. Even when the world ends, Far Cry stays the same.